At issue: Whether the Religious Freedom Restoration Act of 1993 (RFRA), 42 U.S.C. §§ 2000bb et seq., which provides that the government “shall not substantially burden a person’s exercise of religion” unless that burden is the least restrictive means to further a compelling governmental interest, allows a for-profit corporation to deny its employees the health coverage of contraceptives to which the employees are otherwise entitled by federal law, based on the religious objections of the corporation’s owners. We are well aware of the coming Supreme Court arguments concerning Hobby Lobby and the Affordable Care Act. The question is seemingly simple in its statement but complicated in its answer. Can an owner of a company enforce his or her religious beliefs on its employees by denying benefits required by statute? 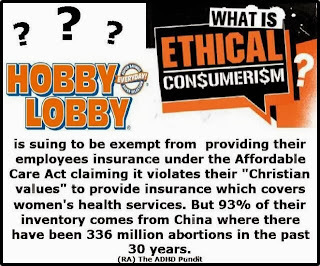 We know the owners of Hobby Lobby are Christians. They run advertisements on Easter reminding us to “know” Jesus of Nazareth. They are closed on Christian holidays while other stares remain open. I have no argument over the owner’s beliefs or business practices. I do argue that the ACA is not meant to protect a business, but to provide health insurance for the individual and not all employees of Hobby Lobby agree with its owners as it concerns birth control. I cannot claim to understand the intricacies of the anti-birth control issue. I can see the argument for the anti-abortion stance, though I am still out to find anyone believing in Freedom of Choice who is “pro-abortion.” I can understand where the use of the “morning after” contraceptives would be contrary to one’s religious beliefs, but to force that same belief on others is, or at least should be part of the discussion. The deeper question is whether a corporation has the same rights as an individual as it concerns religious beliefs? Citizens United laid the ground work here by declaring that corporations “are people” and 1) can claim First Amendment rights concerning political free speech and 2) monetary donations are a form of speech. Citizens United really concerned the regulatory oversight of the government and a corporation’s interest in these regulations. The Hobby Lobby and Conestoga Wood Specialties Corp. v. Sebelius are taking a similar stance. The difference here is that the companies are denying health benefits mandated by law to those who may not share the same religious opinions. Should a privately held corporation be considered a “person” and have the same rights as an individual under the 1993 Religious Freedom Restoration Act? The greater question is can a corporation have a religion? This is different than a 501(c)(3) church, synagogue or temple that is devoted to a religious dogma. Here we are speaking of a for-profit organization that does not lend itself to just religious materials as a Christian book store would. Even then the book stare cannot discriminate because of one’s faith - or lack thereof. It is difficult to tell where the Court will come down on these cases. Siding with the corporation will anger a portion of the population, the pro-choicers, the atheists and secular Humanists and other secular groups. Siding against the company will light the ire of the conservative Christian movement. Who they piss-off should be of no concern to the Court. It must make its decision based on law, not popular sentiment. In both cases, the corporations are privately held. Would there be a difference if the corporation were public, sold stock and has shareholders? What if were a majority of the shareholders who call decide that they will not comply with certain portions of the law because of religious beliefs of the majority? I believe that both Hobby Lobby and Conestoga Wood are wrong, that the law was written to be all inclusive, that the ACA, deemed constitutional by the same Court, was meant for the individual person and in this case personhood and a dogma cannot be bestowed on a corporation.